ESET's multi-layered technology allows us to detect and react to threats faster, helping all our customers benefit from stronger and more effective protection. "ESET Smart Security protected against all of the public web-based threats and targeted attacks. It blocked 100 per cent of the threats. This software was also entirely effective when handling legitimate objects, giving it the rare privilege of a 100 percent overall rating." "Lately, ESET has been one of the best performing products in our VBSpam Comparatives with very strong results. Taken together, a long history of excellent performance and no false positives, is a clear indicator of a reliable spam filtering product for business." Virus Bulletin, a leading independent testing authority, tested anti-spam products by sending thousands of emails through each system in real-time. The VBSpam Final Score measures how successful the anti-spam product was at catching spam while simultaneously avoiding false positives. "ESET demonstrated excellent performance when it came to detecting over 11,000 threats in the test, with almost no burden on the system." In a recent test of macOS security solutions by AV-TEST, ESET achieved the top score. ESET was the only solution in the test that detected all malicious files for both macOS and Windows. This demonstrates that ESET solutions provide the best protection for customers with heterogeneous environments. "False Positives (FPs) are an important measurment for AV quality. One FP report from a customer can result in large amount of engineering and support work to resolve the issue." Even one false positive can cause serious problems. If an antivirus solution is configured to immediately delete or quarantine infected files, a false positive in an essential file can render the operating system or crucial applications unusable. "ESET Smart Security 9 improved significantly, confirming its low performance impact." 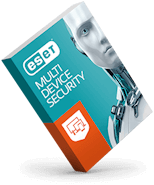 "ESET is well known for being extremely light on system resources." Long-Term Network Load Test – Communication across a network is increasingly critical in the work environment. Similar to hardware on business systems, the behavior of the network has an impact on the operation of business devices. ESET approved its low network impact in this test. In this test AV-Comparatives examines the client-side malware definition database of each solution, smaller size demonstrates better efficiency of security solution while maintaining high detection rate.